The California Mathematics Council (CMC) is a state-wide organization, with officers elected by the entire membership and a governing board appointed by the officers. The CMC functions as an umbrella for the three regional sections: North, Central and South. Each Section also has officers elected by all CMC members in its own geographic area and an appointed Board. Section Membership is determined by your mailing address (school or home). We are you, the 6,000 teachers, administrators, parents, and teacher-educators from California, 45 other states, Canada, Australia, and seven other foreign countries who are committed to improving mathematics learning in the private and public classrooms throughout California, North America and the world! All of the work of the Council, with one exception, is done by volunteers. These pre-K to 16 classroom teachers, retired teachers, principals, parents, district superintendents, authors, project managers, college professors, students, and others devote themselves tirelessly to bring you our fall conferences, our quarterly journal, The ComMuniCator, teacher and student awards and activities, and updates on events in Sacramento and Washington which affect the mathematics classroom. The best way to get involved with CMC is through your local affiliates. Volunteer your time to them and then get involved with organizing our fall conferences. You’ll be helping teachers and students and will have an impact far beyond your classroom. Statewide, CMC consists of three sections, South, Central and North which for historical reasons also includes portions of Nevada near Reno. 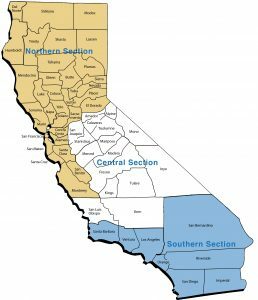 consists of 16 counties: Alpine, Amador, Calaveras, Fresno, Inyo, Kern, Kings, Madera, Mariposa, Merced, Mono, San Joaquin, San Luis Obispo, Stanislaus, Tulare, Tuolumne. consists of 8 counties: Imperial, Los Angeles, Orange, Riverside, San Bernardino, San Diego, Santa Barbara, Ventura. consists of the other 34 counties. Washoe County and surrounding Nevada counties are also part of the Northern Section.